You, Me and Movies: Ghostbusters Cinematic Universe? Well its a new era in Hollywood. Just as Hollywood must make everything into a fad, why would the idea of a shared universe of movies be any different? Hollywood has turned nearly every young adult novel series into a franchise. We have superhero franchises built on a flowing continuity. Apparently, universal monsters are following suit, as is Robin Hood and King Arthur. It seems in the near future, the "cinematic universe" will be the next Hollywood go-to for money. It seems anytime when an idea in movies clicks, Hollywood has cash-out on the idea until it dies, why would the cinematic universe be any different? While I may sound like I am complaining, I think the idea of a shared universe of movies would fit the bill on "Ghostbusters" perfectly. I have read countless times that that the version of "Ghostbusters" we got in 1984 was a much smaller version of the story Dan Aykroyd wanted to tell. If Aykroyd had gotten his way, the ghostbusters would have traveled through parallel dimensions and overall it was going to be a much bigger, much stranger movie than what we got. It seems Aykroyd was very much willing to expand the universe of this story early on. That scene when Venkman, Ray and Egan leave the bank, discussing franchise rights and how rich they would get off of it wasn't some gag. I know I stated this before, but I would have loved to see the Ghostbusters story expand, seeing Ghostbusters offices open up across the country and even across the world. Seeing how different cultures could tie into the different cinematic styles of those nations and cultures would have been one hell of a treat. I don't know if we will ever see a franchise like that, but perhaps something of the sort is coming our way. I have already discussed the all-female "Ghostbusters" movie and I have supported the idea for awhile. I am still a little afraid that the new movie will just reboot the idea, something I am positively against. But now, I am not so sure. It seems another movie is being made, a movie that has Channing Tatum attached to star. Something that may involve Dan Aykroyd and Ivan Reitman once again. 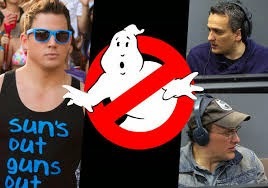 It seems that Sony is already trying to get Anthony and Joe Russo to direct this "all-male" Ghostbusters movie. Basically, we have two "Ghostbusters" movies on the way, one with chicks and one with bros. I think trying to break these movies down into anti-gender politics arguments is a little short-sighted at this point. These movies could somehow be connected to each other. I really don't think Sony developed this "all-male" movie just to counter the "all-female" movie. Honestly, we don't know enough about this Tatum/Russo/Aykroyd movie to know if there won't be any ladies in it, so at this point we should relax and not call the movie misogynistic just yet. I am interested in seeing how these movies play out. I also supremely hope that they both are connected to the greater "Ghostbusters" story in some way. I think the Russo brothers are an interesting choice as directors. It is clear from TV's "Community" that they can do funny, and its also apparent from "Captain America: The Winter Solider "that they can handle high concepts. I'll be interested to see if they do end up directing since they seem so tied down at Marvel at this point. I think Tatum could do very well in the "Ghostbusters" universe. This is an interesting time to be a fan of this franchise, and as a series of movies I hold very dear to my heart, I hope none of this gets fucked up.